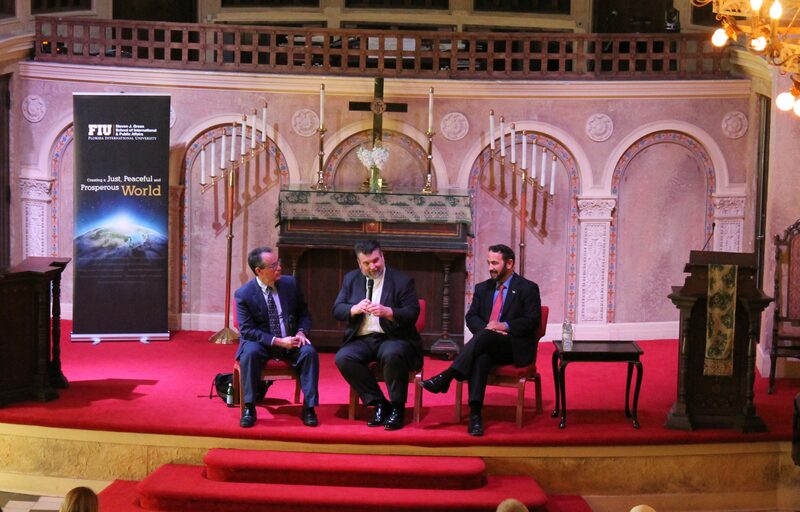 Rabbi Steven Engel, Reverend Bryan Fulwider and Senior Imam Muhammad Musri led a community discussion about the life-changing impact of creating interfaith friendships. From the tragic shooting at the Tree of Life Synagogue to verbal acts of hatred and discrimination, it’s clear that bigotry and intolerance plague our society. Many would argue that forging strong interfaith relations is perhaps more important now than ever before. To break down barriers and combat stereotypes, every year the Steven J. Green School of International and Public Affairs hosts an interfaith community event featuring religious leaders and scholars. 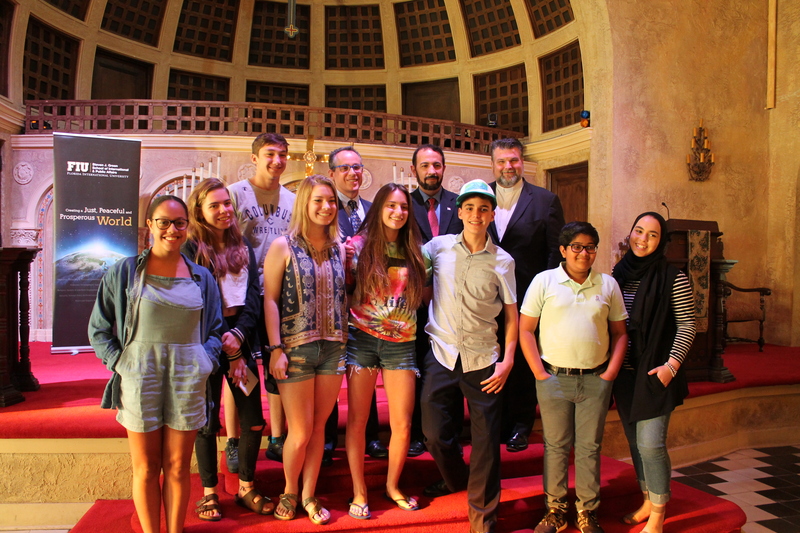 This year, the Green School teamed up with a newly created community group in Miami-Dade County, Interfaith Youth Miami, an initiative started by local high school students to promote understanding and foster new friendships between various faith communities. The special conversation featured a rabbi, an imam and a pastor – longtime friends and co-hosts of an Orlando public radio show that promotes interfaith friendships and a religiously inclusive worldview. The conversation took place at the Coral Gables Congregational United Church of Christ in front of a religiously diverse audience who came together for the event. It was dedicated to the memory of Roberta Daum Shevin, a pillar of Miami’s faith community and former executive director of MCCJ (formerly the Miami Coalition of Christians and Jews). Dubbed the “Three Wise Guys,” the religious leaders – Rabbi Steven Engel of the Congregation of Reform Judaism of Orlando, Senior Imam Muhammad Musri of the Islamic Society of Central Florida and the Reverend Bryan Fulwider, formerly of the First Congregational Church of Winter Park – led a candid discussion on interfaith relations, religious diversity and bringing people together for true dialogue. The “Three Wise Guys” posed for a photo with InterFaith Youth Miami founder Alexander Sutton (in a cap gifted him by the gentlemen) and the youth group’s student leaders. During their presentation, the men took questions from the audience and discussed topics ranging from interfaith marriages to the importance of gathering accurate information about others through credible sources. But, how can we in our daily lives go about connecting with people of other faiths in a comfortable way? Food is one option, said Musri. Case in point: His own friendship with Engel and Fulwider. More than 20 years ago the three men became friends – over lunch. The leaders were optimistic about the future – impressed by the high school students in the interfaith youth group and the students’ embrace of interfaith friendships. Alexander Sutton, a junior at Coral Gables Senior High School – and the founder of InterFaith Youth Miami – shared the reason why he started the high school group.